You don’t have to prepare a full Seder—or even be Jewish—to celebrate Rosh Hashanah. 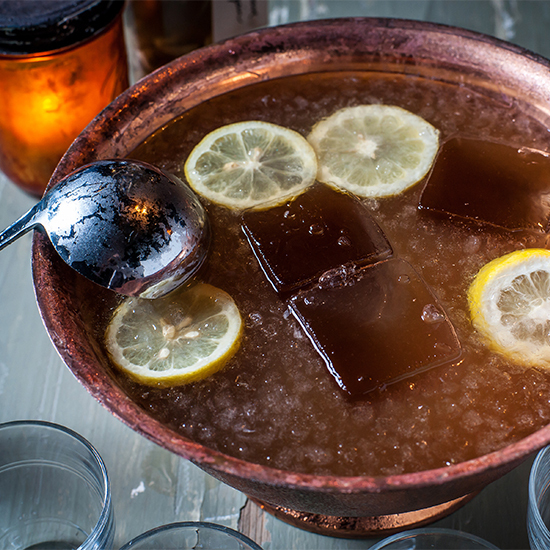 Instead, use the holiday as an excuse to make a fantastic bowl of punch. Traditionally, Rosh Hashanah means dinners accented with apples and honey (to symbolize a sweet year), round challah (to symbolize the cycle of the year) and dishes like brisket or whole roast fish. But you don’t have to prepare a full Seder—or even be Jewish—to celebrate. Instead, use the holiday as an excuse to make a fantastic bowl of punch. Jill Dobias, the co-owner and bar manager of Joe & MissesDoe in New York City, comes up with a new Manischewitz-infused cocktail for every Jewish holiday. This year, she’s making High Holy Punch for the restaurant’s annual Rosh Hashanah dinner, with fresh apple cider, lemon juice, red wine, dark rum, orange peels and, of course, Manischewitz. In keeping with the traditional New Year symbolism, Dobias serves the punch in a round punch bowl and ladles it into round glasses, like stemless wine glasses. The punch isn’t the only modern addition to Dobias’s Rosh Hashanah. She adds to the festive spirit with a playlist packed with contemporary versions of traditional Jewish music, like a rap version of “Shana Tova,” a classic Rosh Hashanah song. “I’m obsessed with all things progressive Jewish,” she says. Dobias’s punch is best when it has time to meld overnight, so load your iTunes up with Hebrew rap and prep a big bowlful right now. Combine all of the ingredients in a bowl and let it meld overnight. Serve in glasses over ice, garnished with apple, orange or pear slices.